I hate posting an image with no source (anyone know it?) but this one completely caught my eye on MFAMB this week. 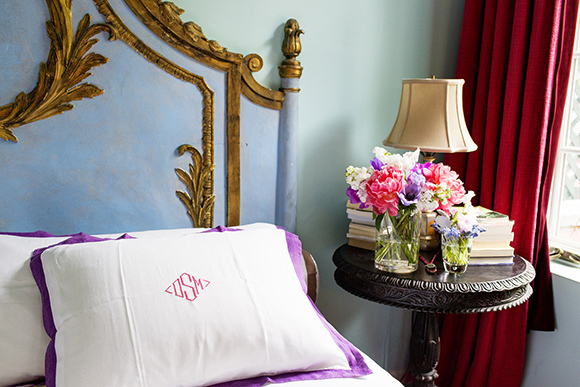 Mostly because that pillow has my monogram but also because I LOVE the rich raspberry curtains paired with violet shams, a powder blue headboard and seagreen walls. It all works to create such a rich vignette. I can taste fall in the air...or is it just wishful thinking? Hope you have a fantastic weekend...see you next week! I think that picture is from a feature in House Beautiful on the julian and Olatz Schnabel's bedroom.